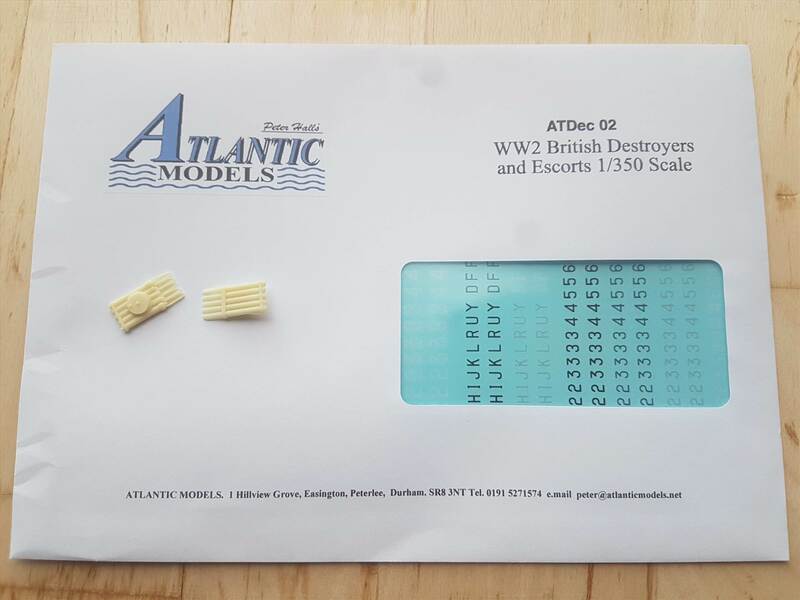 The kit is Atlantic Models ATK35058 HMS Hesperus, a Brazilian H with the later design of bridge. 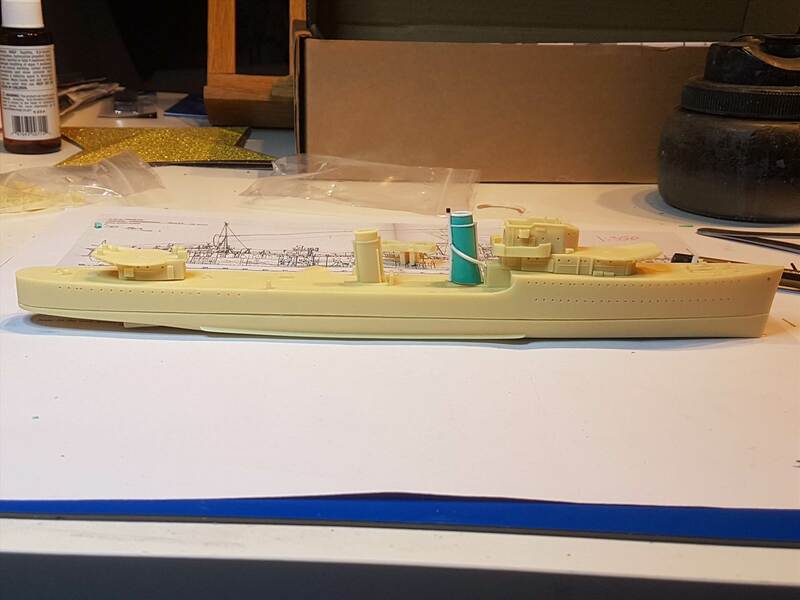 Due to a family connection, I wish to build the I-class destroyer HMS Imperial, pennant number D09, which was built by Hawthorn Leslies in Tyneside in 1936. 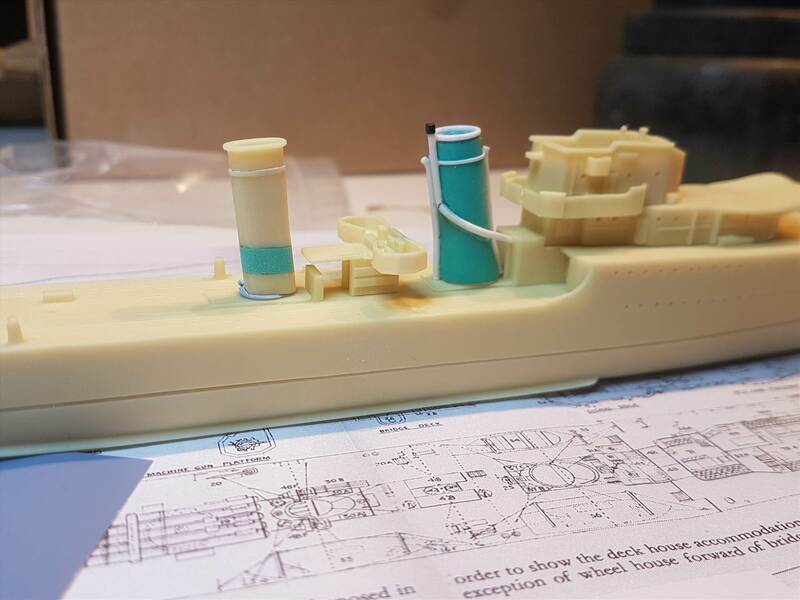 The I class was a continuation of the Brazilian H making Peter's kit a very good starting point, however there are some differences to be addressed. The easiest problem is that the I-class had 4 of the 4.7in QF Mk.IX single mounts. 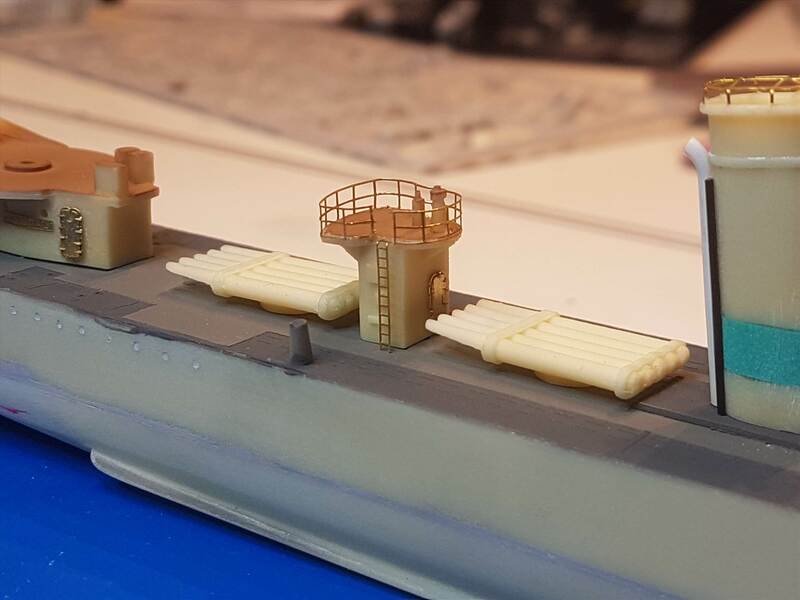 The Hesperus kit provides 3, lacking Y-turret. Peter kindly supplied my kit with a fourth mount knowing my plans for this kit. Next up, the H-class funnels were unequal height but both had oval cross sections. 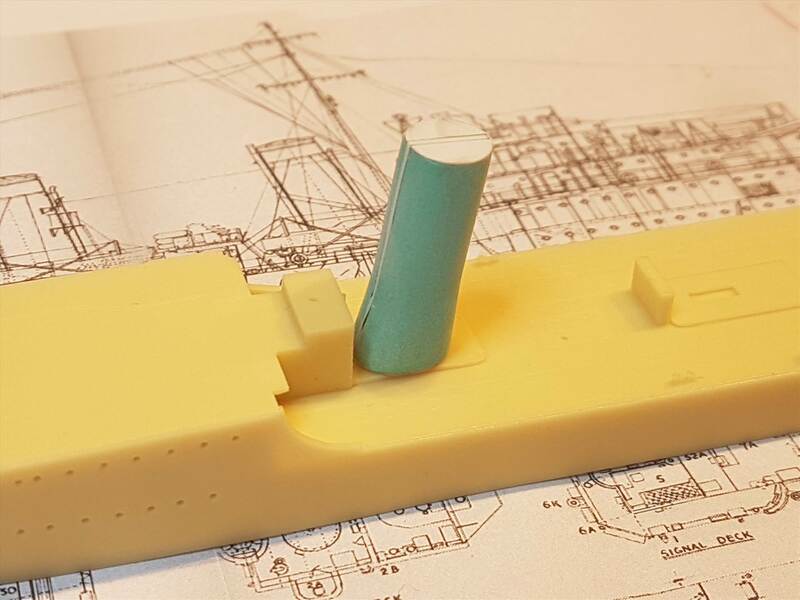 On the I-class, the aft funnel was taller, approximately equal in height to the forward funnel. The forward funnel was circular in cross section. 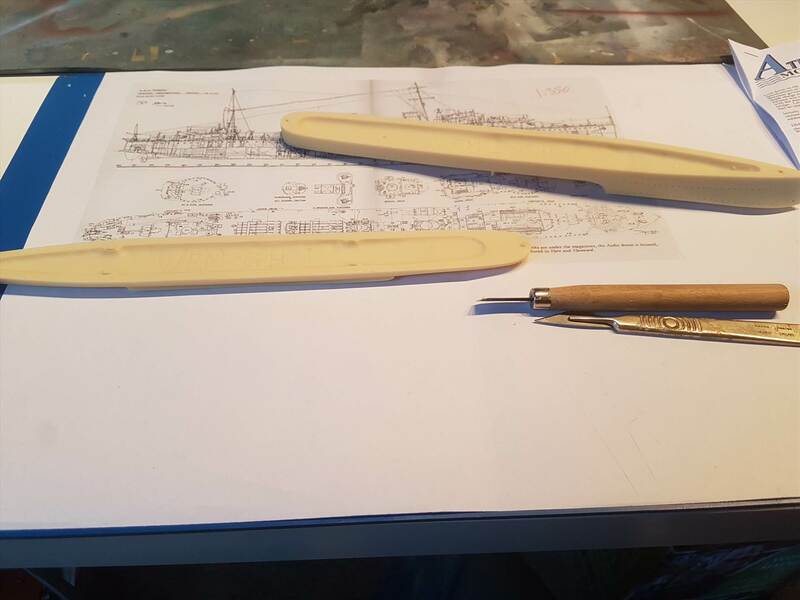 Armed with a set of plans (again, thank you Peter!) 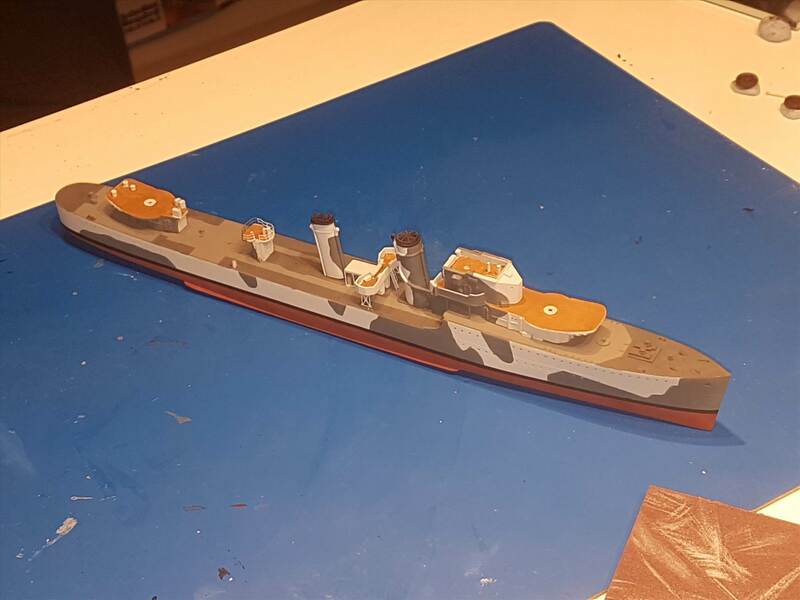 I set about extending the aft funnel and replacing the forward funnel. 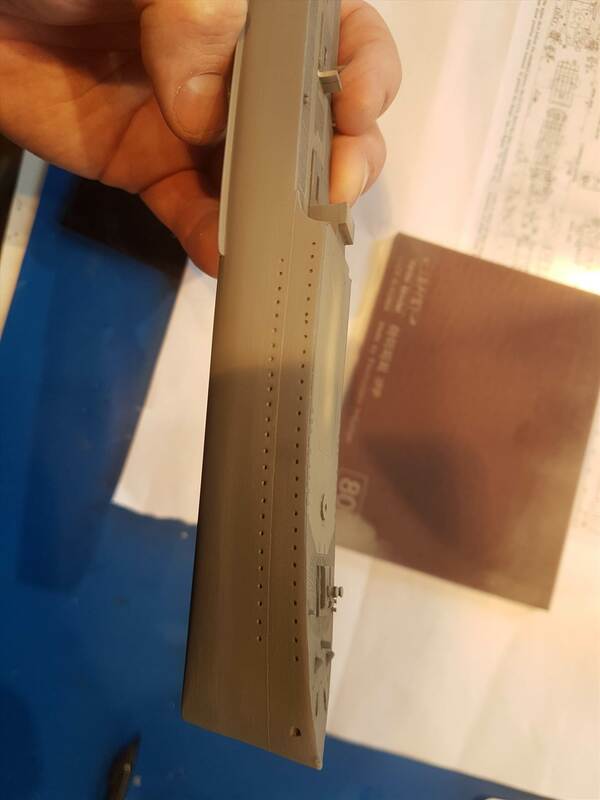 The fit of the upper and lower parts of the hull is excellent. 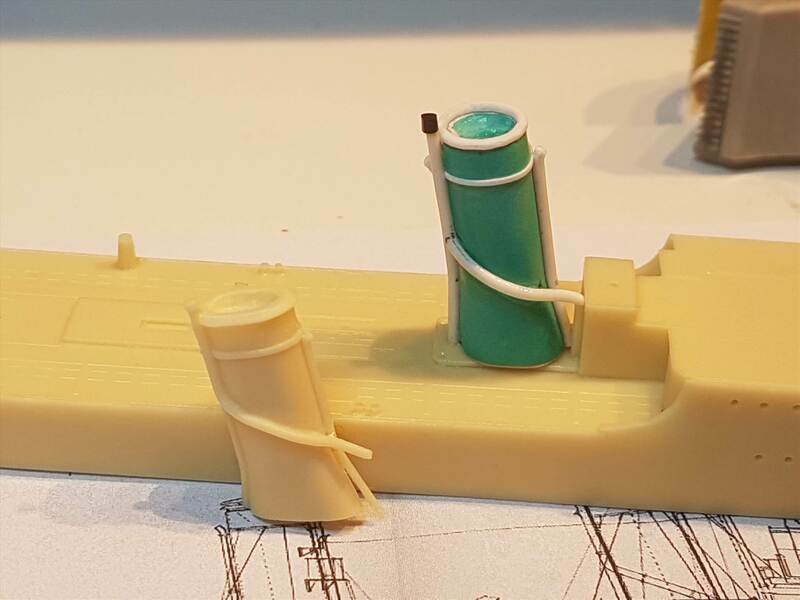 I will go as far as to say that Peter's resin kit fits together far better than any injection moulded ship kit from Trumpeter that I have assembled. 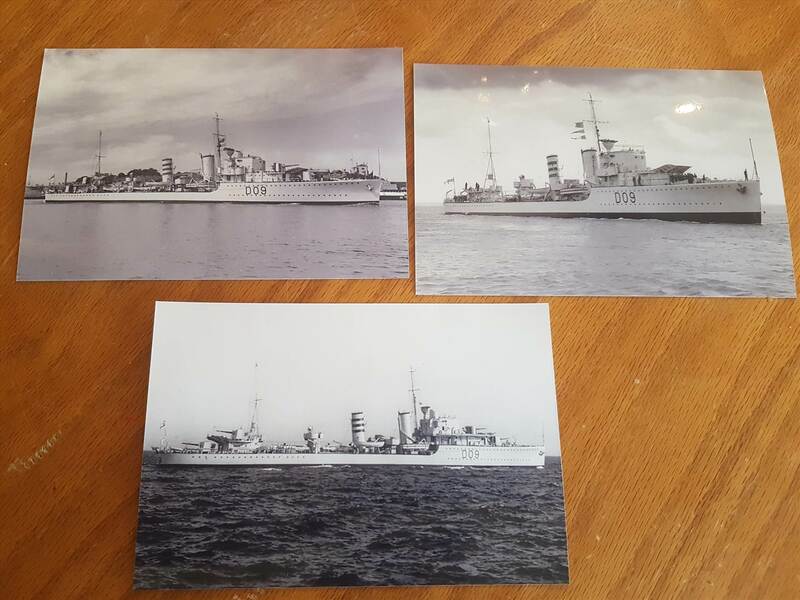 I have purchased some photographs of HMS Imperial for reference. Whilst well photographed before the war, I know of only a single image taken during the war. 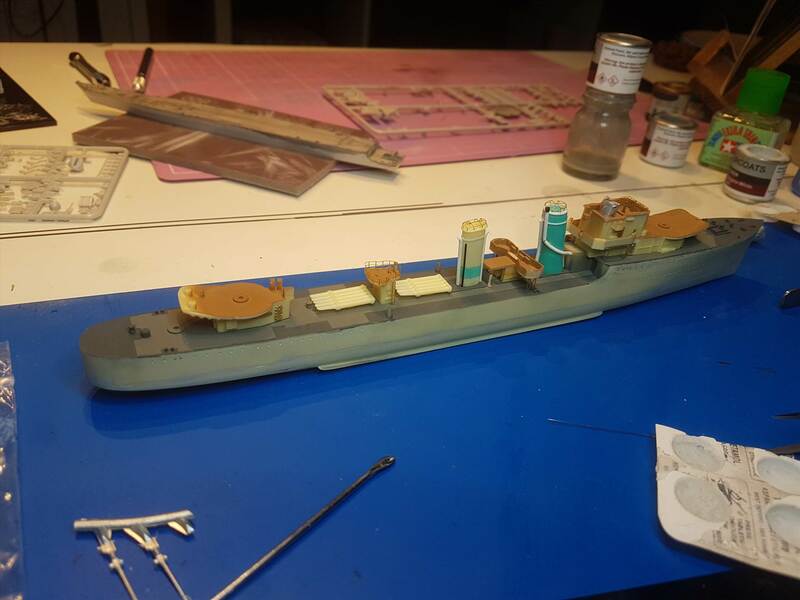 I hope that in high resolution it can offer some clue as to how HMS Imperial was painted in the Mediterranean in 1941. If not, then she shall be painted in 507C in pre-war guise. There is a good reel of footage on Roland Smith's Royal Navy in Colour DVD taken from HMS Ivanhoe which appears to show some of the 3rd Flotilla in all-over Mediterranean Grey (507C) whilst others look to have Home Fleet Grey hulls with Mediterranean Grey upperworks. 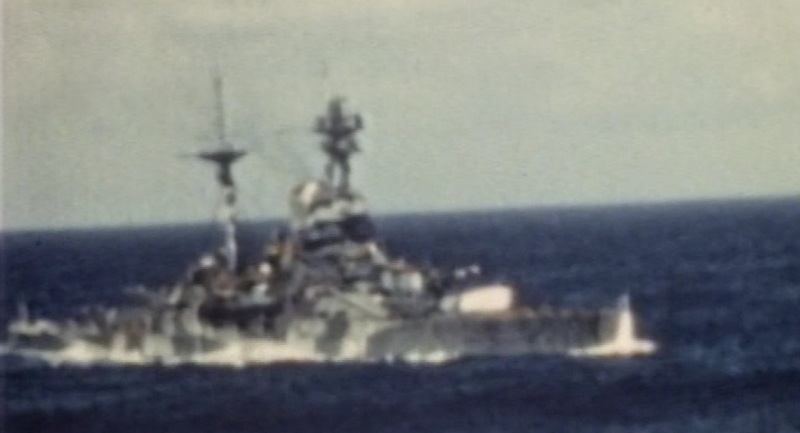 I cannot make out HMS Imperial's pennant anywhere on the footage, but all of the destroyers in the footage clearly show the 3 bands on the aft funnel to be in red. The neutrality stripes on B-turret are in the usual red, white and blue. 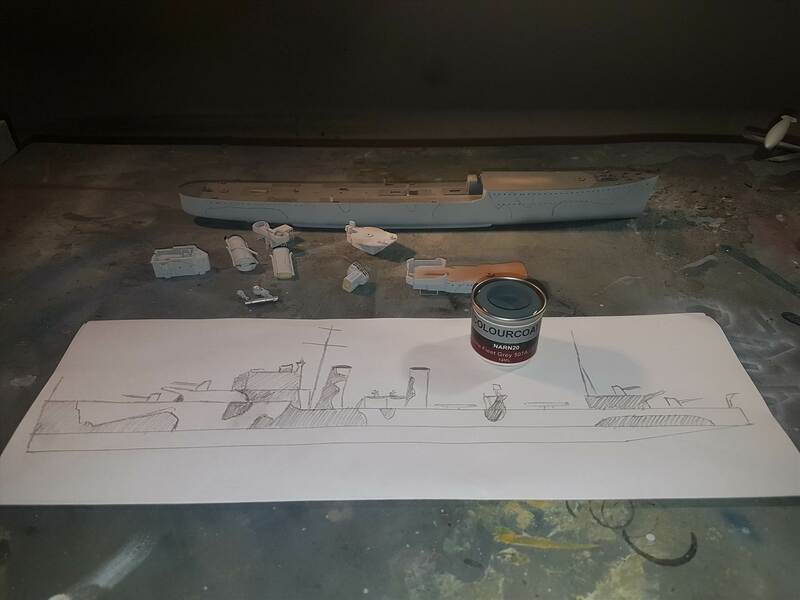 I have started work on the deck painting. Those who have been steering me on paint research have also been helping me more recently with deck coatings. What a minefield! 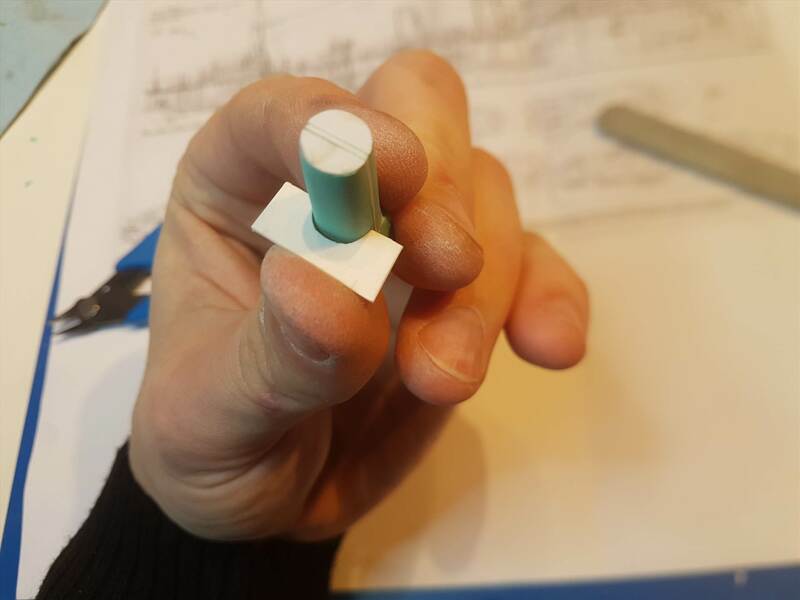 The I-class were trialled with 3 comparable latex-based trowel-on deck coatings from 3 different manufacturers. Semtex Ltd was one supplier. The trouble is, that the three products were different colours, one described as "the colour of dry asphalt", one green and one brown. 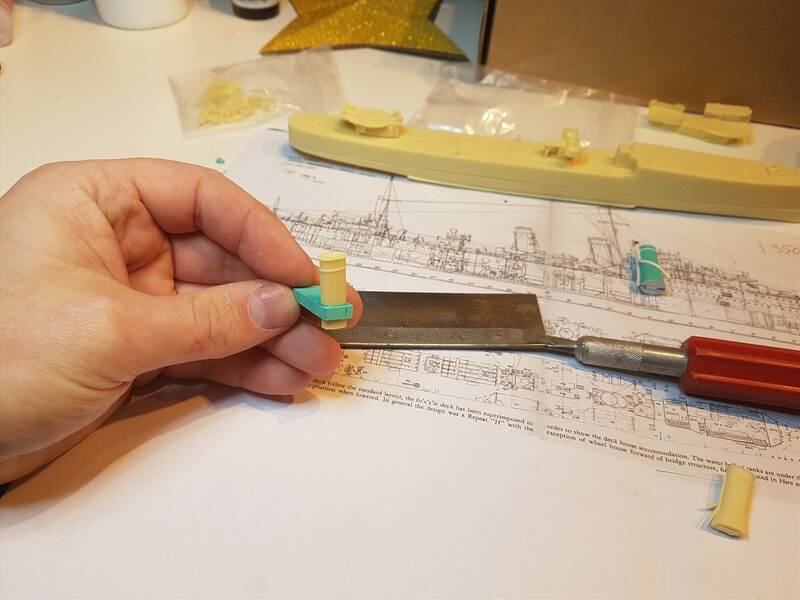 There may have been 9" high bands of contrasting colour around the base of superstructure items the troweled on stuff butted up against. So far, I cannot determine which manufacturer's product was which colour, nor even which groups of 3 I-class ships received the products from each of the 3 suppliers. Whilst I am keen on getting things right, I am also pragmatic and in the interests of actually building this model rather than pontificating until I depart this world, I had to make a decision. 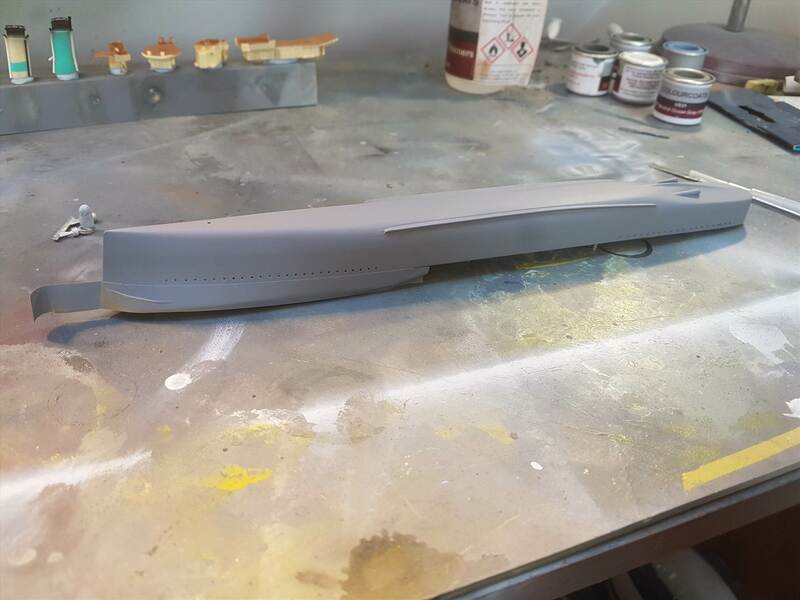 There is reasonable evidence to support the bridge and platforms being linoleum covered, which gives us some brown colour, so I chose a grey that looks like the roads around the North East of Scotland, on the rare occasions when they are dry. 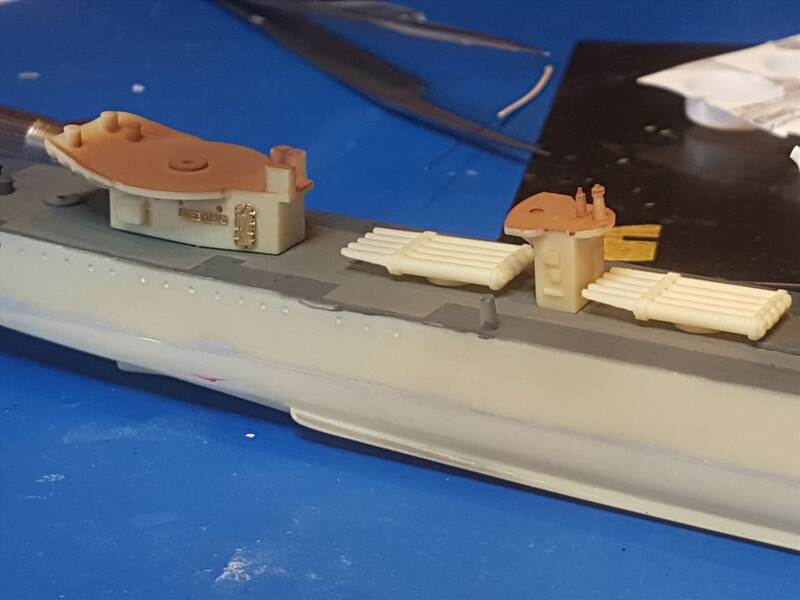 I have sprayed the main kit parts accordingly. 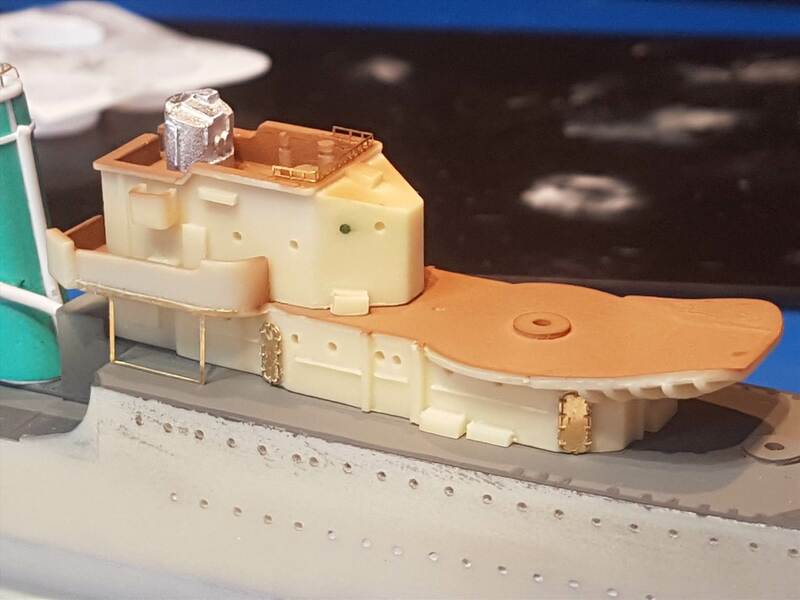 At this point, I realised that the little platform at the back is surplus to requirements, as Imperial carried two pentad 21in torpedo tube mounts. 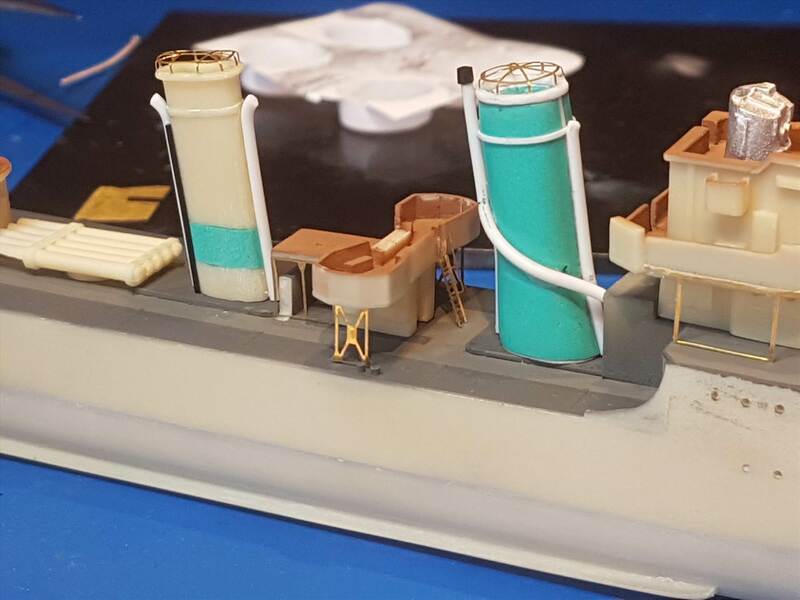 The H-class kit provides a single quintuple torpedo tube mount. I could scratchbuild them, but am exploring alternatives presently. 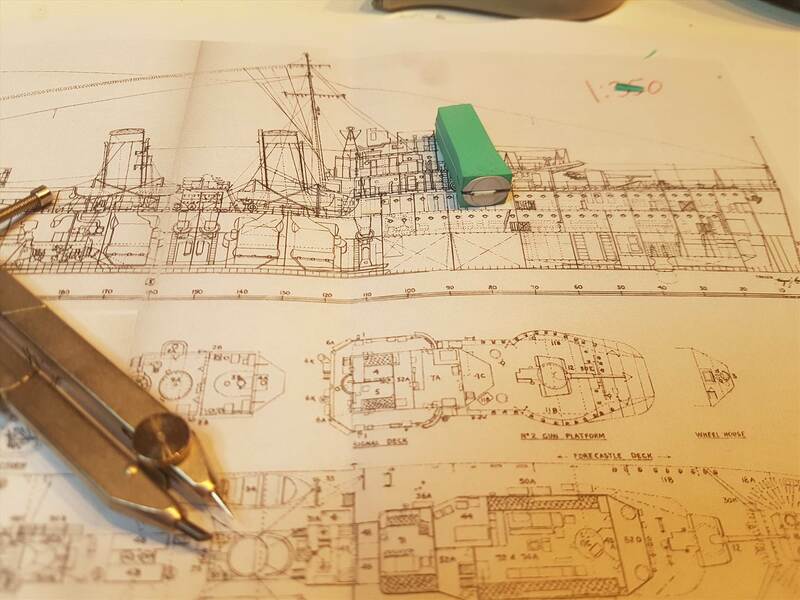 Having spoken with Peter Hall, I have now acquired the necessary pentad 21in torpedo tubes so in a few days we'll be cooking on gas. 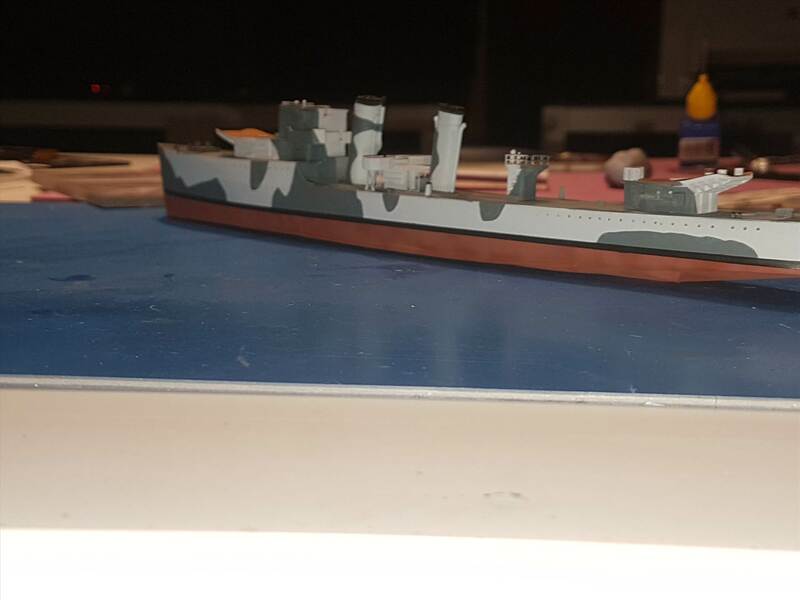 I can begin the detailing at this point I think, whilst awaiting my photograph to arrive from the AWM which will probably prove entirely inconclusive as far as camouflage is concerned! It will be interesting to follow this build. 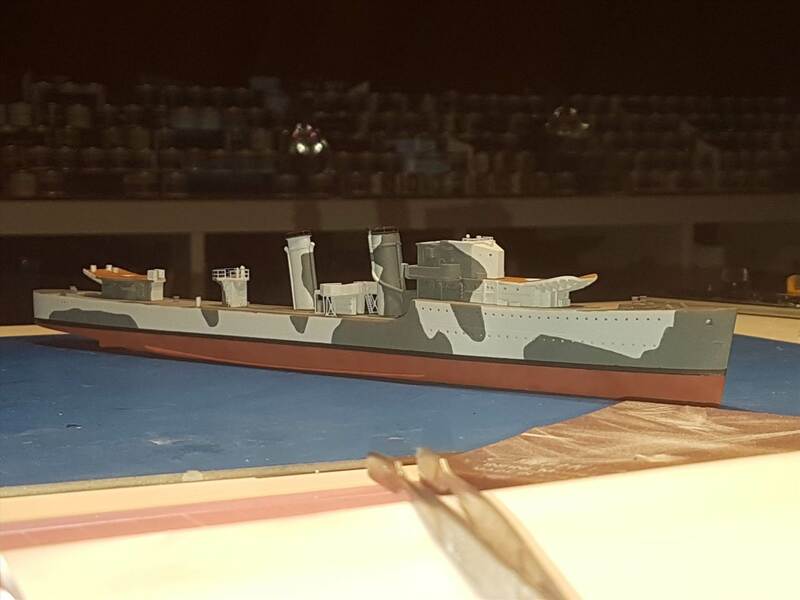 I like the British, rather small, rather overcrowded-looking destroyers. This weekend was much too nice to stay indoors peering at tweezers, so I didn't. Instead it was invested in cutting and rolling some grass (there's a lot of it), vacuum cleaning the cars and cleaning the glass inside (there's little point cleaning the outsides though! ), buying some soil and new plant pots (huge ones on clearance sale at B&Q for 50p each ) to replant some Jasmine, a new cherry tree and the girls' sunflowers, repaired a small puncture on a Lay-Z-Spa (best thing wot we ever bought) and did some maintenance, built a new picnic table, sat on our garden swing for a while and had lunch outside, drank a couple of pints of Belhaven Best and found my eldest daughter up a tree somewhat higher than I would like if I'm honest! It also includes the braces for the tripod mainmast that my I class has which Hesperus did not (it had a pole mast). 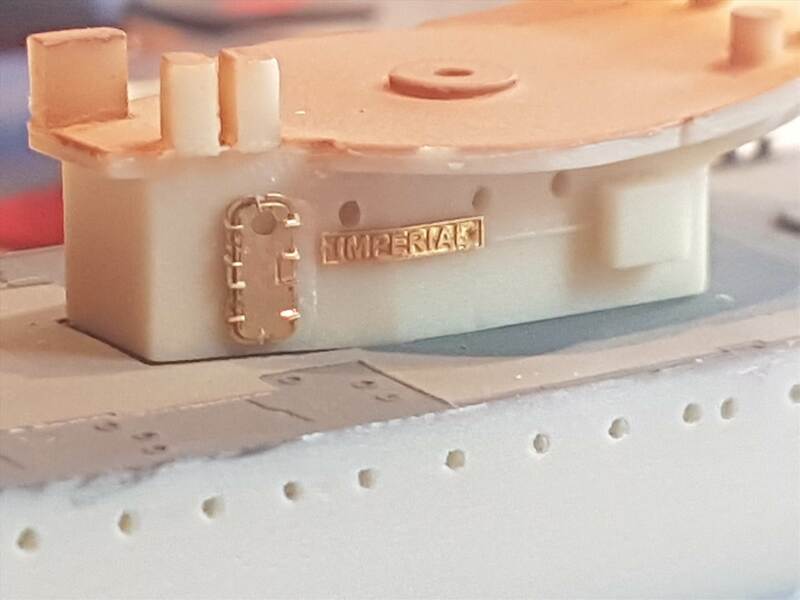 A very nice touch is that the fret contains a pair of name plates for every ship in the G, H and I class. Roland Smith's DVD (the colour one) shows the name plates attached either side of the bulkheads below X-turret, so it's nice to have those which say IMPERIAL for this purpose. 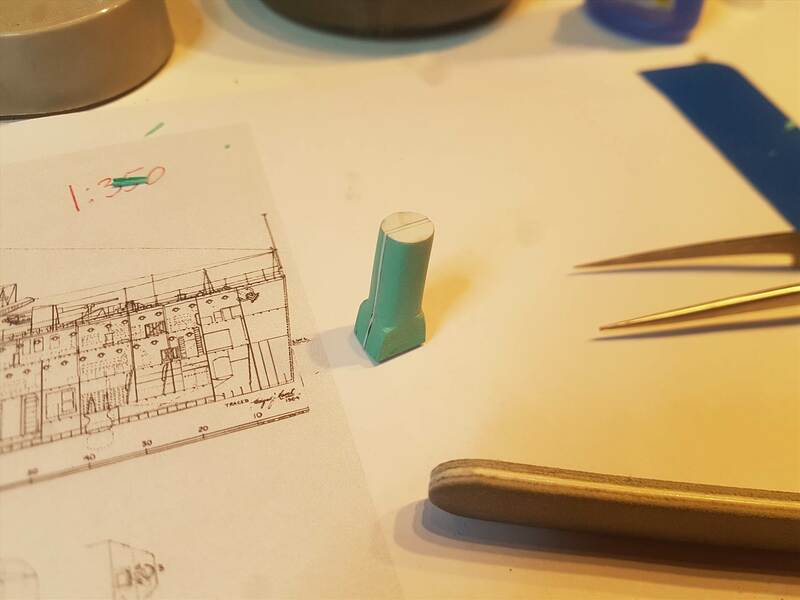 Yesterday's task was to sit comparing my photographs, the I class plans, the kit instructions and the PE fret working out which parts I needed and which were surplus to my specific requirements, and marking up accordingly. I now (think) I know what I need and what I don't, which should simplify the rest. 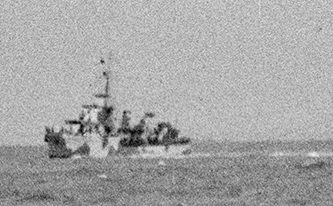 During this, I noticed that one of the photographs I acquired (above) and indeed the only one which clearly shows a breakwater fitted in front of A turret also shows no main armament nor the range finder fitted. I don't have a date for the photo, but I assume this was taken towards the end of construction. She looks fairly complete otherwise. And if you keep doing just that for five hundred years or so you will end up with a pretty nice lawn. Was that a Ringworld reference? I haven't really dived into this fully yet because I'm waiting for the AWM photograph to either provide wonderful insight into how Imperial was painted in the Med, or convince me that that knowledge is lost to time and I need to content myself with Imperial in her pre-war paint. However, this has arrived. I don't think I'm lacking any pieces now. 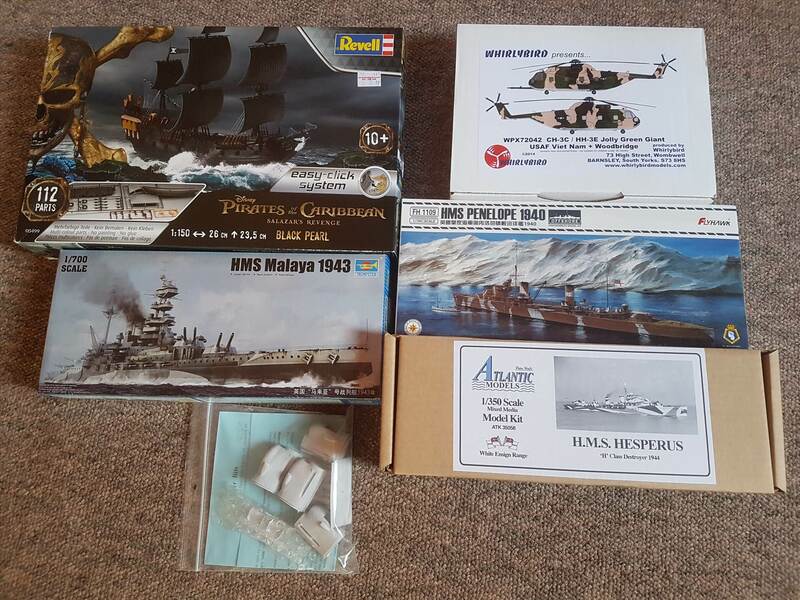 Today I popped out to our nearest model shop to pick up some detail parts. After the 30 second walk we entered and I left with some accessories to dress up the model some more. 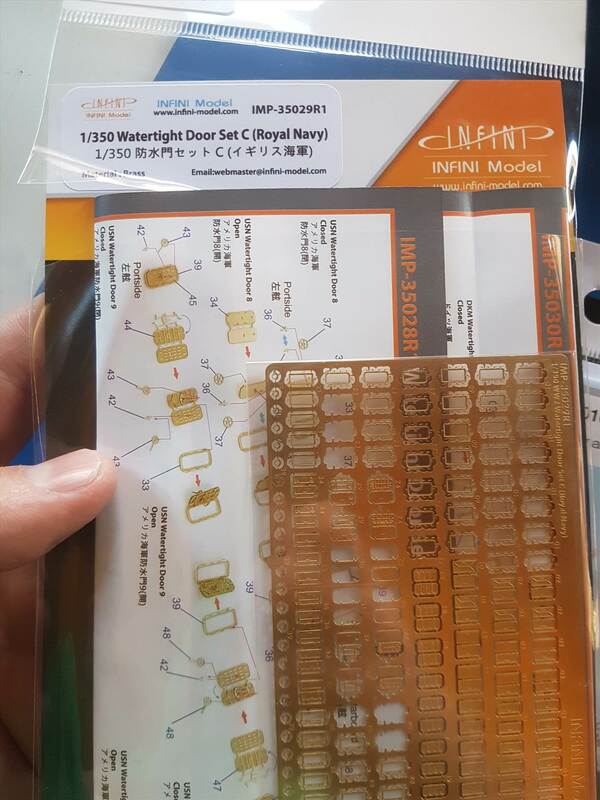 I picked up these Infini Model 1/350 Watertight Doors (Royal Navy) which admittedly look like a real faff, but I've learned that they are infact very simple to assemble and I personally prefer to leave the door frame attached to the fret whilst I insert the door and fold over the latch things. There are 6 types of door, each in open (with relief detail on the inside) or closed positioning. It also includes some portholes and scuttles in two sizes. 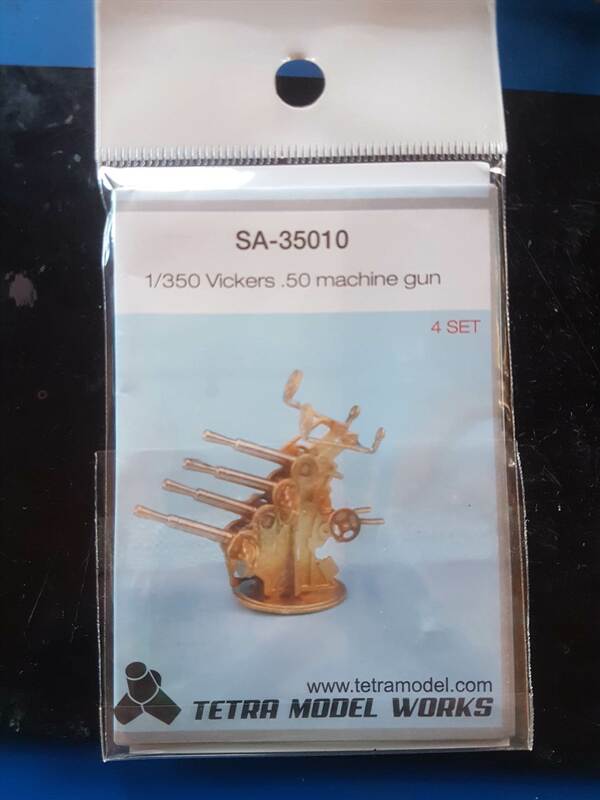 I also swiped another Tetra Model Works /350 Vickers .50in Quad Machine Gun set. 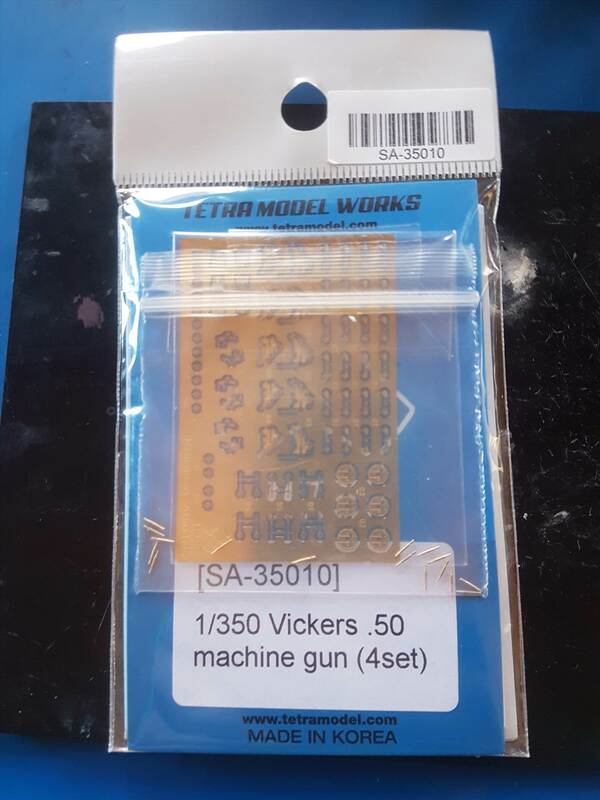 I used these and was very satisfied with them on my HMS Hood, and they're still the best .50 Vickers guns available in 1/350 so not to use them again on Imperial would seem a backwards step. I added a few more bits of detailing today, but without really getting too involved and burning out as I am prone to. The ship now has a name! This morning I got a few more bits done. This started with cleaning up some of the white metal parts. No photos to show, but then again my value-added is not much to look at. 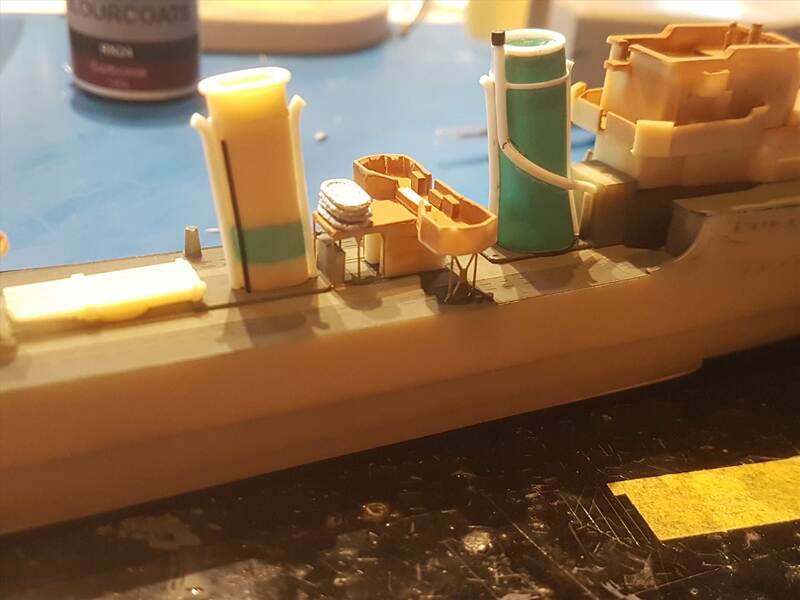 I then added the remaining watertight doors and got a ladder and the handrailings around the searchlight platform fitted. A couple of portholes on the "Brazilian H" bridge that aren't shown on my photographs of Imperial were filled too. I'm thinking I could really do with starting the paintwork about now, but I have been trying to hold off as long as possible. I shall need to commit to that very soon though. >Today I popped out to our nearest model shop to pick up some detail parts. You actually have an honest-to-god model shop nearby - and one that carries stuff like this at that? I am suitably impressed! A 3 year long joke between my wife and I - it's our own shop and we don't have far to go for it. The days of traditional brick and mortar LHS in the North East of Scotland are long past their hey-day. There is one a 20 minute drive away with some common plastic kits but the nearest good shop (even then they don't have any PE type stuff) is Wonderland Models in Edinburgh which must be 150 miles from here. I had mentioned earlier that there was a family connection. This is my great uncle Alex Kelman. He was the brother of my grandmother on my father's side of the family. Alex died before I was born and all my grandparents are dead now also. However, it is understood that Alex retired as a Petty Officer and that he was aboard HMS Imperial at Crete. The newspaper cutting is about a graver situation a couple of months later when his next ship was sunk by a U-Boat. 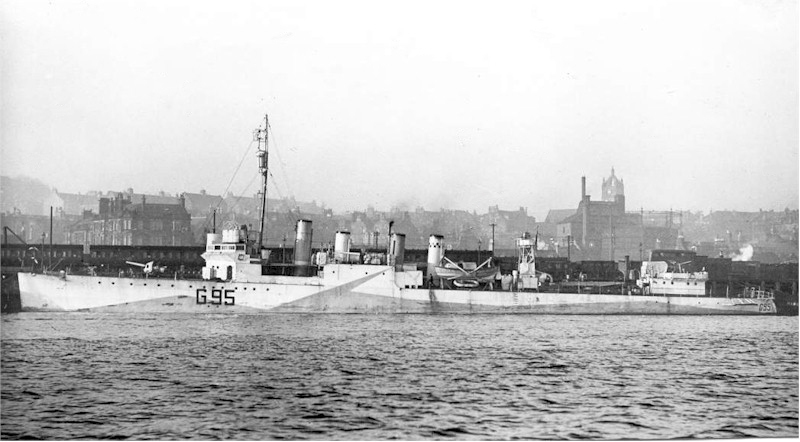 HMS Stanley was a "Town class" lend-lease 4-stacker flush deck American destroyer similar to the famous USS Wickes and HMS Campbeltown - only Stanley was one of two of those in the Royal Navy converted as Long Range Destroyer Escorts which involved the removal of forward boilers, the loss of the forward two funnels, the deck house built up in their place and extra fuel carried where the boilers used to be. In addition, the bridge was reconstructed and raised. 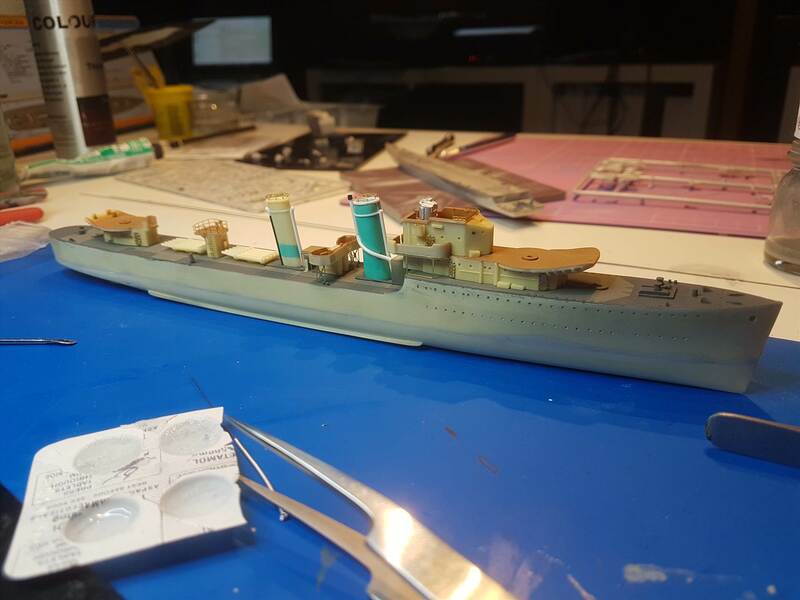 That will be a future project of mine using Atlantic Models' ATK35060 HMS Montgomery, but I need to perform the LRDE conversion myself. I don't have plans, only some photographs so it will involve some educated guesswork. 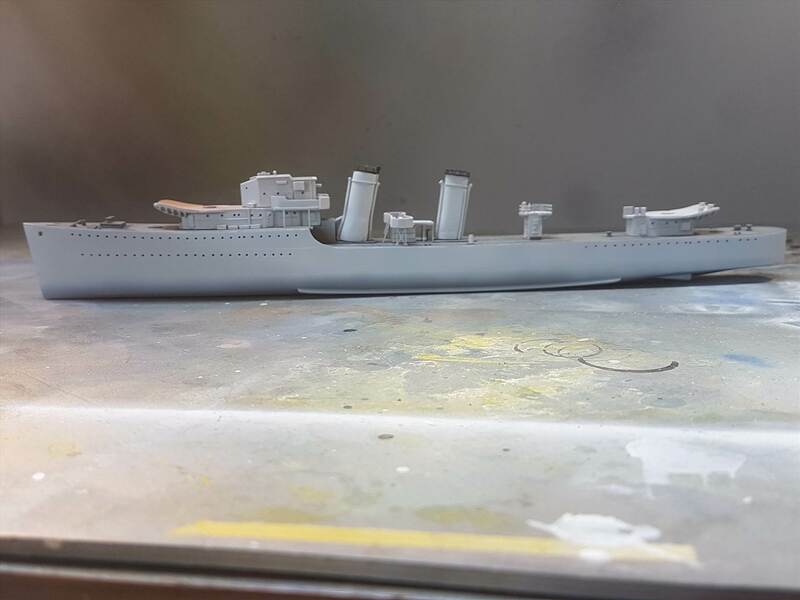 Here is a photograph of HMS Stanley which when compared to the unconverted Montgomery shows the most obvious differences. 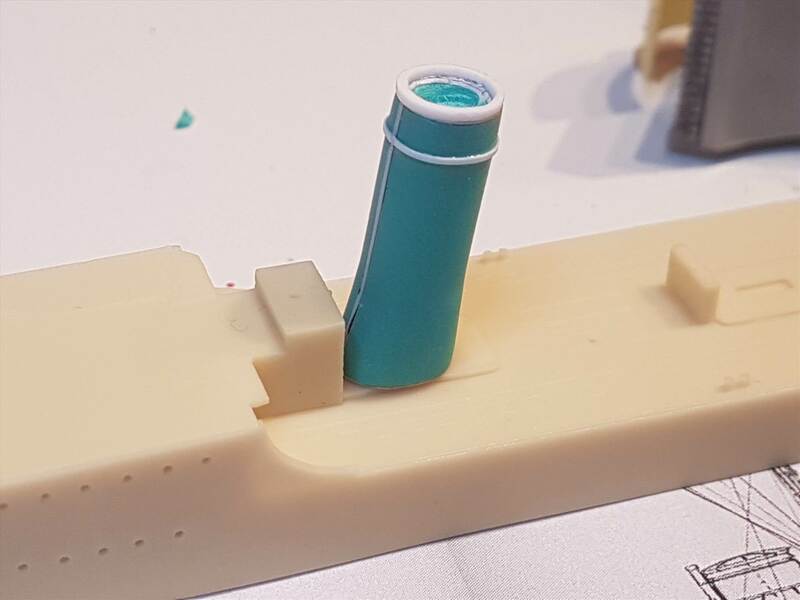 Wow - that will be a very interesting model. Nice work on this one, as well! If anyone is interested, my high resolution photograph was waiting to download when I stepped off a plane at Heathrow today. I had to go on a trip to London last week so got nothing done. 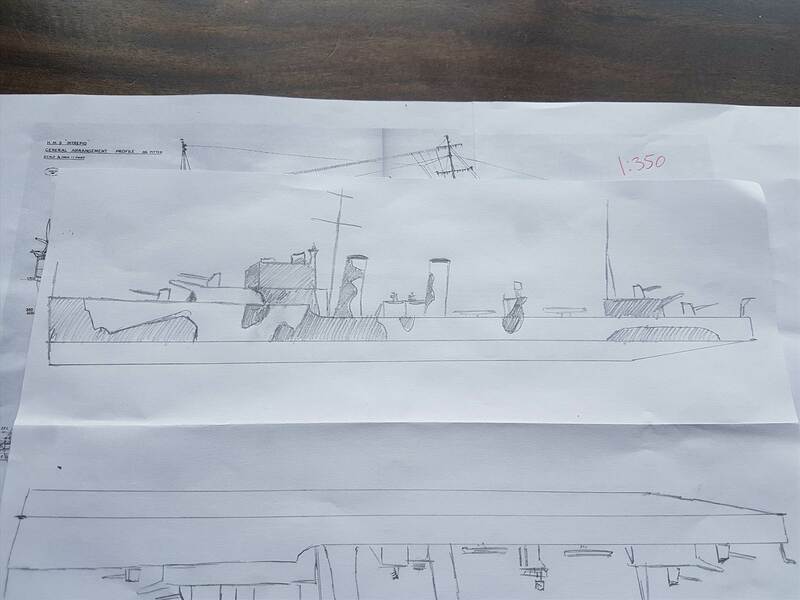 I have sketched out an I class in 1/350 scale though and transcribed what camouflage pattern can be seen from the image. Towards the stern is getting towards the interpretational but there's a reasonably clear view of the bow, bridge and funnels. The other side may or may not have been a mirror image of this. I doubt we'll ever know. As to colours? Again it's anyone's guess at this point really. The relative tones of the photograph would appear to indicate a fairly high contrast two-tone scheme that might be consistent with some other schemes captured in colour that could have been 507A and 507C or could have been custom mix greys. Although now known to have some issues in some areas (e.g. 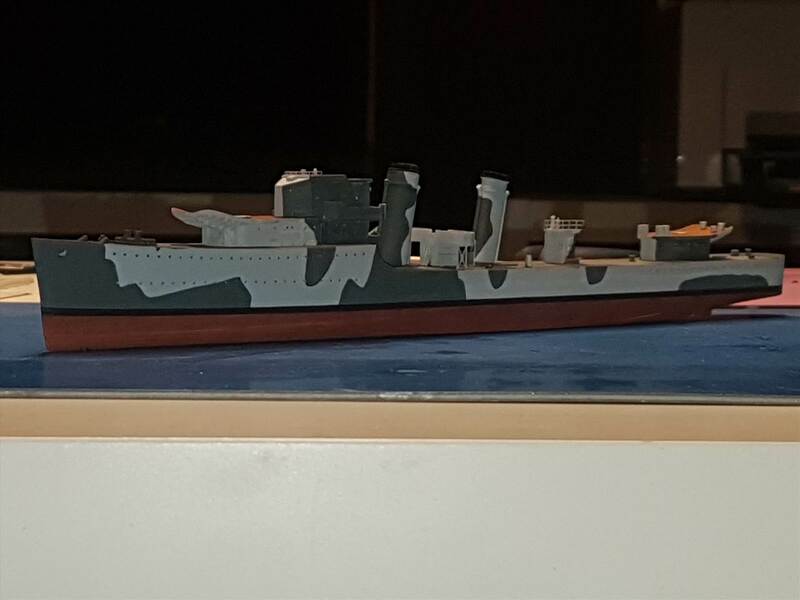 507B), Alan Raven's Warship Perspectives Volume 1 does contain numerous destroyers in similar two-tone schemes and he also believed them to be 507A and 507C, as well as stated that most of these destroyers had similar designs port and starboard. 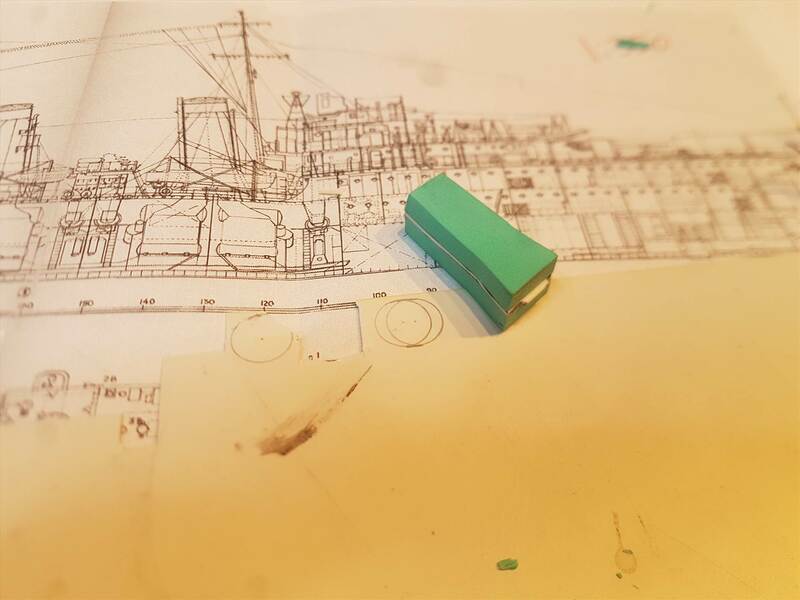 At this point, I feel like I might be up for having a go at portraying HMS Imperial when great uncle Alex was definitely on board. My father was over here yesterday and when shown the photograph of Imperial on tow, he suddenly recalled Alex telling him of the time they struck a mine and the big crack that opened up from weatherdeck down to the waterline, and that the crack moved as the ship reacted to the sea and the general fear amongst the crew that she may break in two. Colourcoats' adhesion to resin is generally pretty good. Nevertheless, I don't want any accidents. 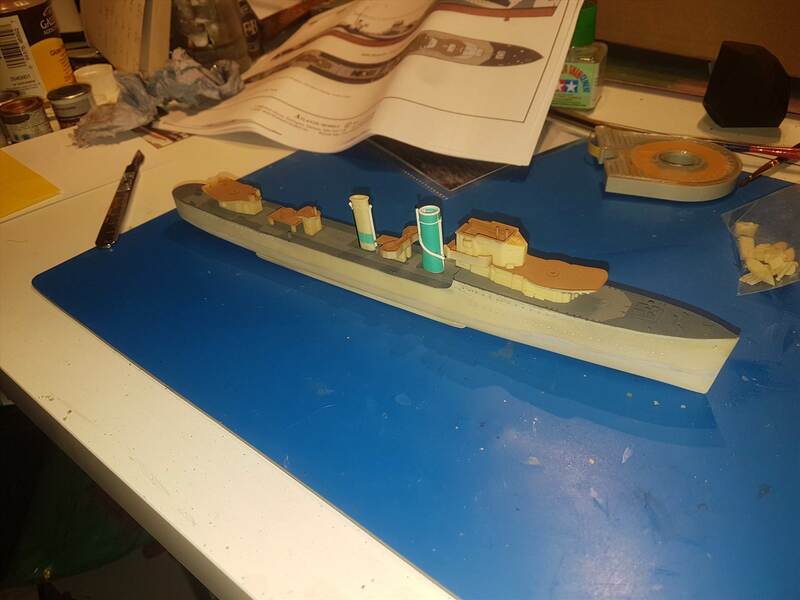 As I also wanted to add a plating seam it seemed sensible to give the whole hull a quick coat of Halfords primer. Then, a couple of strips of masking tape and another coat provided the seam. Halfords primer is ok but a bit too rough for me so I flatted it back with an Infini sanding sponge. Doing this also highlights the seam just added, but it will be less conspicuous after paint. I just used a more-or-less mirror image for the starboard side. Now to get on with the rest of the detailing and some more subtle colour work.